Early in December, Bernt and I booked our fourth trip to Congo. We planned to depart on January 30. The time of departure were to coincide with the first harvest in Nsanda. 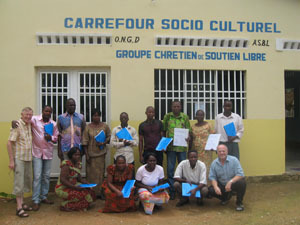 One of our tasks in Congo this time will be to disburse loans to the January 11 group. The group has been waiting a year for their loans due to the priority of another project. We reckon that the sum of the loans for this group will be somewhere around 250 000 SEK. But the final sum of the loans won´t be confirmed until we have completed the training, gone through their cost estimates and had personal consultations with every one. Early in January, the balance on our accounts in Congo and Sweden was about 85 000 SEK. We needed to bring in 165 000 SEK to be able to carry out our plans for the February visit to Congo. When we checked the accounts again on January 28, the balance had increased to 263 100 SEK. We board members are very grateful to our sponsors and to the trust and appreciation you show through your generous loans and donations. Never before have we received this much money in a single month. In many respects, it is the supply of money that governs our business. The loans to our entrepreneurs are a fundamental part of the three tools we work with – education, business loans and follow-ups.